Researchers have found a way to coat corrosive but highly energetic lithium metal anodes with an atoms-thick layer of alumina to make lithium-ion batteries last longer. Alexander Kozen, of the University of Maryland’s Department of Materials Science and the Institute for Systems Research, and his colleague Malachi Noked (also in the Department of Chemistry and Biochemistry,) used a technique borrowed from the semiconductor industry –- atomic layer deposition (ALD) -- to put down a layer of aluminum oxide, 14 nanometers thick, all around the anode. The research was funded by DOE's Nanostructures for Electrical Energy Storage (NEES), an Energy Frontier Research Center. "The mission of the center is to reveal the science of nanostructures in batteries to develop methodologies to help prevent problems," said Gary Rubloff (MSE/ISR), Director of the NEES Center. Lithium metal is widely known as a promising anode material. But the high reactivity of lithium metal presents major challenges that may impede commercial adoption. Most candidates for a next-generation, beyond-lithium-ion battery rely on using reactive metal anodes. However, with a protection layers, bare lithium metal reacts with organic electrolytes, which can reduce battery capacity and possibly form tree-shaped dendrites capable of shorting out the battery or causing an explosion. Kozen said that aluminum oxide is simple and relatively inexpensive to use, though the team says they are investigating other higher performance coatings. 'The technique has been used in computer chip-making, so establishing a parallel infrastructure for the battery industry is reasonable,' said Noked. 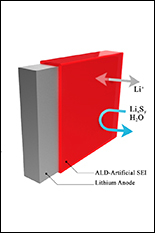 The team reports improved lithium-sulfur battery capacity for 100 charge-discharge cycles, an important milestone to demonstrate the efficacy of this technique as a proof of concept. Results were published in the journal ACS Nano.